Must watch regarding knowledge of vedas. Idol worship is always allowed in Vedas. 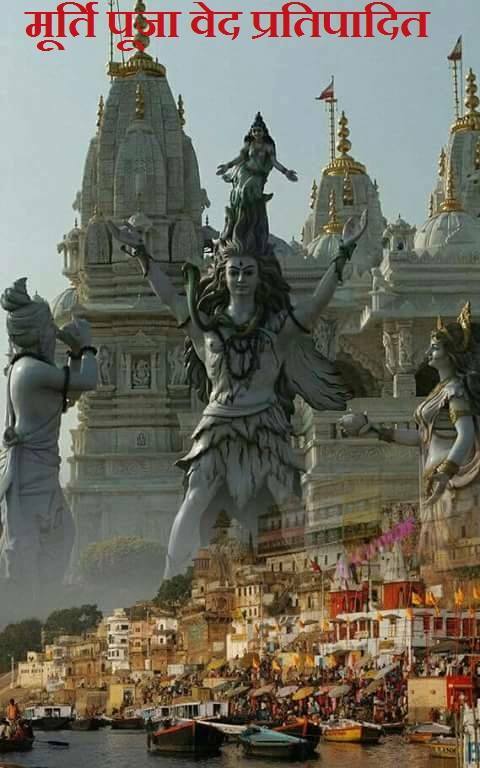 अर्थात् जगत् के कारण रूप परब्रह्मको और नाशवान् प्रकृति-शरीर आदि को एक ही जानता है वो मुक्त हो जाता है ।"
ये श्रुति स्पष्ट कहती है - "ईशा वास्यमिद ँ् सर्वं यत्किन्च जगत्यां जगत् ! (शुक्ल यजुर्वेद ४०/१) अर्थात् - इस सृष्टिमें जो कुछ प्रत्यक्ष है ,जड़ अथवा चेतन है तथा प्राणी ,जीव, पर्वत ,समुद्र ,नदियां और भूमि हैं,वे सब परमात्माके द्वारा ही आच्छादित हैं !" जब सब कुछ परमात्माके द्वारा ही आच्छादित है तब प्रकृति-जड़ पाषाण-शरीरादि की उपासना निषेध क्यों होगी ? उसका फल अंधकारमय क्यों होगा ? मूर्ति पूजा प्रतिपादन - सत्यार्थ प्रकाश में दयानन्द सरस्वतीने शुक्ल यजुर्वेदके निम्न मन्त्रसे मूर्ति पूजा का निषेध किया है किन्तु ये बहुत ही भ्रामक है - दयानन्दका मन्त्र भाष्य - "अन्धतम: प्र विशन्ति येऽसम्भूतिमुपासते ! ततो भूयऽइव ते तमो यऽउ सम्भूत्या ँ् रताः !! ( शुक्ल यजुर्वेद ४०/९) अर्थात् - जो 'असम्भूति ' अर्थात् अनुत्पन्न प्रकृति कारण की , ब्रह्मके स्थान में उपासना करते हैं ,वे अंधकार अर्थात् अज्ञान और दुःखसागरमें डूबते हैं । और 'सम्भूति' जो कारण से उत्पन्न हुए कार्यरूप पृथ्वी आदि भूत, पाषाण और वृक्षादि अवयव और मनुष्यादि के शरीर की उपासना ब्रह्मके स्थान पर करते हैं ,वे अंधकार से भी अधिक अंधकार अर्थात् महामूर्ख चिरकाल घोर दुःखरूप नरक में गिरके महाक्लेश भोगते हैं ! "जबकि इस मन्त्रमें मूर्ति पूजाका कहीं भी विरोध नही है . किन्तु इस मन्त्र का अब सम्यक् अर्थ करते हैं - " न तस्य प्रतिमाऽअस्ति यस्य नाम महद्यशः । हिरण्यगर्भऽइत्येष मा मा हि ँ् सादित्येषा यस्मान्न जातऽइत्येष: !! (शुक्ल यजुर्वेद ३२/३) अर्थात् - उस परमात्म स्वरूप पुरुष का कोई आकार नहीं है । उसका यशऔर नाम ही महान् है । "हिरण्यगर्भ" ,"यस्मान्न जातः ", और "मा मा हिंसित् " आदि मन्त्रों में उसकी महिमा का वर्णन हुआ है । " इस मन्त्र में कहा गया है यद्यपि उस परमात्मा का कोई आकार-स्वरूप या मूरत नहीं है तथापि उन महान् परमात्माका हिरण्यगर्भ आदि मन्त्रों में वर्णित है अर्थात् वो परमात्मा सृष्टि के आदि में आकार -स्वरूप रहित रहते हुए भी सर्गके समय स्वयं ही हिरण्यगर्भ ,विराटपुरुष ,प्रजापति और संवत्सर के रूप में मूर्तिमान् होता है । "संवत्सरे हि प्रजापतिरजायत । स इदं हिरण्यमाण्डं व्यसृजत् " ! ये विराट पुरुष या हिरण्यगर्भ ही इस परमात्माकी प्रथम मूर्ति है ! "संवत्सरस्य प्रतिमां यां त्वां रात्र्युपासते । सा न आयुष्मतीं प्रजां रायस्योषेण सं सृज " (अथर्ववेद ३/१०/३) अर्थात् - हे रात्रि ! संवत्सर (प्रजापति -परमात्मा ) की प्रतिमा (मूर्ति) जिस तेरी हम उपासना करते हैं ,वह तू प्रतिमा हमारी प्रजाको धान-पुष्टि आदिसे संयुक्त कर " की उक्ति से परमात्मा के साकार स्वरूप होने ,उनकी मूर्तिकी उपासना का प्रतिपादन किया गया है । भगवद्गीता में भी भगवान् कहते हैं - " मया ततमिदं सर्वं जगदव्यक्तमूर्तिना "(भगवद्गीता ९/४) । इन सब प्रमाणों से सिद्ध है शुक्ल यजुर्वेद का उपर्युक्त मन्त्र "न तस्य प्रतिमाऽअस्ति०"३२/३ में मूर्ति पूजा का निषेध नहीं है.. Brain Waves Theory of Bhagavad Gita’s Consciousness and Vedas. 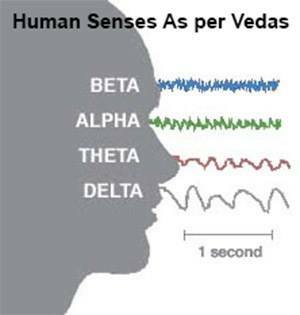 The most scientific truth taught to the world by Hindu texts, Vedas are the sacred sounds and Vibrations that control everything within and beyond Vacuum. Universal creation and destruction revolves around sacred sound ओ३म् (ॐ). 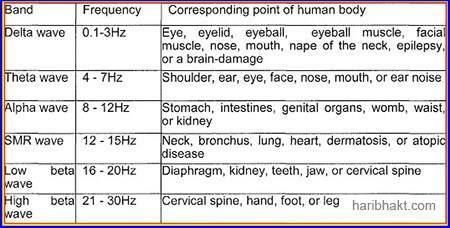 The Earth, the Moon and the Sun are moving and protecting all living things with a natural frequency pulsation of 7.83 HZ — The frequency is known as ओ३म् (ॐ) OM. Our life and the surrounding around depends on two subtle environmental signals, the Yin from below and the Yang from above. 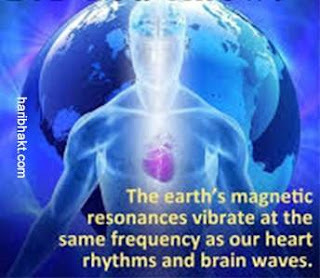 The Schumann wave surrounding our planet being YANG and the weaker geomagnetic waves coming from below, from within the planet, being the YIN signal. The equilibrium of earth and revolvement of planets is maintained by Sacred sounds as mentioned in Hindu texts. Our brain’s ability to become flexible and/or transition through various brain wave frequencies plays a large role in how successful we are at managing stress, focusing on tasks, and getting a good night’s sleep. If one of the five types of brain waves is either overproduced and/or under produced in our brain, it can cause problems. 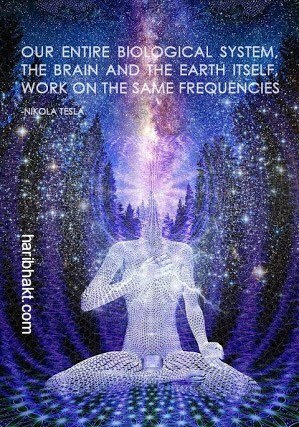 For this reason, it is important to understand that there is no single brain wave that is “better” or more “optimal” than the others. Our brain waves get in sync with the waves of planets in deep yogic meditation. No invader or attacker can ever win over India or its local natives (Hindus). No one can ever destroy its culture. There is always the supreme Bhagwan protecting the Bharat Varsha (Divine India) and Sanatan Dharma. When sea mapping was done by Hindus of Bharat (now India), westerners flocked to the country to study the local civilization and truth about prosperity of native Indians (Hindus). Most of them were interested in looting the country, robbing off the wealth of erstwhile prosperous Hindu Rashtra, Bharat. There were very few seekers from West who came to India to realize the truth of existence and life. Once they somehow comprehended nuances of Hindu texts at surfacial level, they started renouncing their western traits of meat-eating and drinking. They made India their first and last home, never going back to the West. Hardly some of them became global ambassadors of Vedic wisdom. They were more of the view in finding solace for themselves than spreading knowledge of true human values. Some may call them selfish but that’s how they led their lives. Until the turn of the 19th Century, the Western view of the Hindu religion was mostly identified with a dazzling array of cultural mosaic and mysticism of India filled with both imaginable and unimaginable. 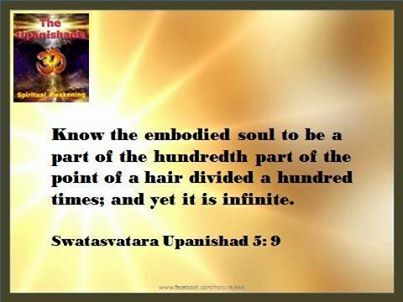 It began to change after Swami Vivekananda gave his famous speech on the teachings of the Vedanta in Chicago in 1900 during the gathering of the World Parliament of Religions. The loot and killings done by Muslims and Britishers led to decimation of their strength and ever-ending misery for the community people ever after. The Karmic cause and effect undid the prosperity and well-being of attackers. The true teaching of the Vedanta contained in the Gita, Vivekananda told his mesmerized Western audience, has very little to do with the flying sadhus, the endless Hindul rituals, and the caste-system. Citing the Gita, he voiced his opposition to organized religion, priestly control of spirituality, and then he also informed us of the existence of the female Rishis (Vedic teachers) in the Vedanta. Over night, Vivekananda introduced to the West the true liberated teaching of the Gita: pursue the beauty of inner Self through the art of detachment and meditation, and harvest the bounty of spiritual fountain. Half a century later, it was a nuclear physicist J. Robert Oppenheimer who finally brought the Gita into the popular vocabulary of the scientists in the West by citing this quote from the Bhagavad Gita. “The Hindu Dharma is the only one of the world’s great faith dedicated to the idea that the cosmos itself undergoes an immense, indeed an infinite number of deaths and rebirths. It is the world’s only religion in which the time scales correspond to those of modern scientific cosmology. Its cycles run from our ordinary day and night to a day and night of Brahma, 8.64 billion years long, longer than the age of the Earth or the sun and about half the time since the Big Bang.” Cosmos (New York: Random House, 1980). Meditation, yoga, and the idea of spiritual living have now become an accepted part of the mainstream society. These popular phenomena have also begun to come under objective scrutiny. As the science discovers the power of spirituality through various scientific tests, the essence of the Gita becomes ever more relevant to our modern society. 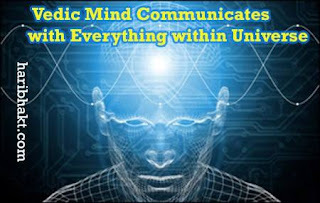 The simple idea of meditation discovered five to six thousand years ago in the Rigveda (oldest of the four Vedas), and a preferred choice of the true knowledge seekers, has been scientifically shown to have power to alter brain waves. Experiments have also shown that meditation reduces criminal intent, stress, and anger, and helps with recovery from illness. 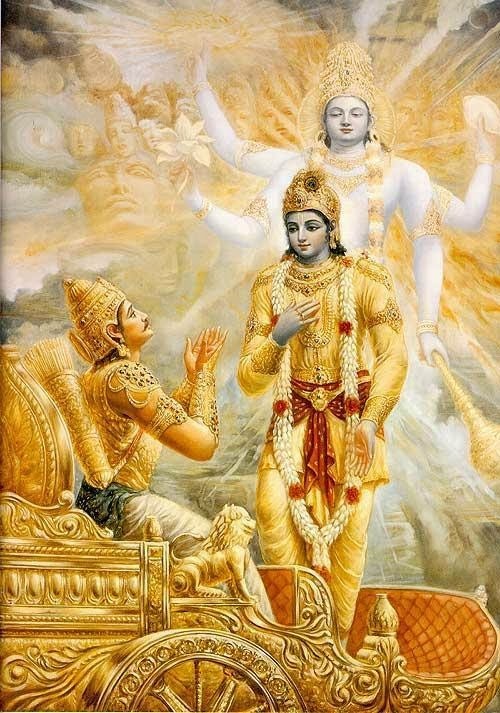 Based on the teachings of Gita, some scientists have been doing experiment by placing electronic devices around the world to detect the existence of concentrated brain wave. They were baffled by an unusual level of concentrated signal picked up by their detectors during the time of the 9/11 incident, Madrid bombing and the similar global catastrophes. A global attention on a single event like the 9/11 seems to have some sort of abnormal effect. “Most humbly we bow to You, O Supreme Lord. At Your command moves the mighty wheel of time. He becomes a lover of all, a part and parcel of the Universal Joy. “The human body is the temple of God. One who kindles the light of awareness within gets true light. The experience of unity is the fulfillment of human endeavors. “Sing the song of celestial love, O singer! May the divine fountain of eternal grace and joy enter your soul. And feel His own presence within. “Of everything he is the inmost Self. And deeply loved as one who is the Self. This Self is eternal and immutable. You are the infinite; the universe is also infinite! From infinite the infinite has come out! Having taken infinite out of the infinite, the infinite remains! “O seeker, know the true nature of your soul, and identify yourself with it completely. O Lord, (may we attain) the everlasting consciousness of Supreme Light and Joy. “O Brahma, lead us from the unreal to the real. O Brahma, lead us from darkness to light. We who offer the food are One. The fire of hunger is One. "Bright but hidden, the Self dwells in the heart. He is the goal of life. Attain this goal!" But changeless is the supreme Lord of Love. “O mysterious and incomprehensible Spirit! Encyclopedias are usually the first level of references and since this is about ancient sciences, I referred “Encyclopedia of History of Science” (published by “Springer Science & Business Media”), in which page 204 says Schrodinger, the co-creator of quantum theory, was inspired by the Vedic texts and he along with Heisenberg built theories which were consistent with Vedantic concepts. While Indian media and students are forgeting Vedas education, Europian Scientists learned and used Vedas in their research. Even Indian Genetry try to stay away from Vedas etc why? because they have inferiority complex developed by British for 400 years and before that by Mughals for 200 years. Time to reclaim identity you son of Bhartas and Aryavart before Europeans say that Sanskrit and Vedas are theirs. See how Heisenberg’s theory of uncertainty is consistent with the teachings of Rig Veda, the book titled “The Hindu Mind” by Bansi Pandit provides more insights with simple illustrations and parallels at page 334. A biography on Schrodinger (by William Taussig Scott) shows how he was inspired by the concept of “Brahman” in the Upanishads. Bohr’s fascination & inspiration from Upanishads is also well documented. Moving beyond Quantum theories, Vedas had inspired scientists in nuclear sciences as well. For example, Oppenheimer (the father of atomic bomb) had publicly stated that access to the Vedas were the greatest privilege of the century. Carl Sagan (a renowned Astrophysicist) was deeply inspired by Vedas and had stated that the Vedic cosmology corresponds to the modern scientific cosmology. During his visit to USA, Swami Vivekananda had inspired Tesla (popularly called father of electricity) to look into Vedic Sciences to overcome the challenges imposed by conventional sciences, which in turn helped Tesla build theories which were later used by scientists for research on quantum physics & relativity. 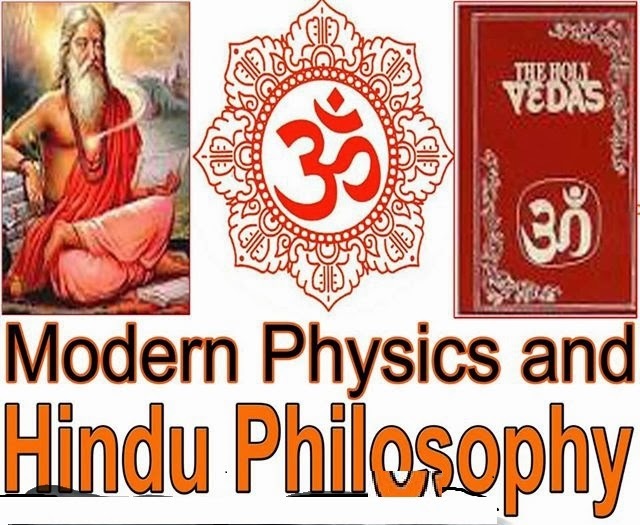 Above references can be used to suggest that some of the Western Scientists were indeed influenced & some of their theories were inspired by Vedas & Upanishads. The Charvaka school was a philosophical movement in India that rejected the traditional religious order by challenging the authority of the Vedas as well as the hegemony the Brahman priests. Contrary to the view that India has always been an entirely religious and spiritual land, the Charvaka school is one of the most irreligious and skeptical systems of thought ever devised. This school is considered part of the heterodox systems (also referred to as heresies) of Indian philosophy, and it is also known as Lokayata, a term which in Sanskrit and Pali means “Naturalist” or “Worldly”. The Charvaka school started to develop around the 7th century BCE, during the time when the culture of world renunciation emerged in India. Buddhist scriptures occasionally mention the Charvaka as part of the wandering religious groups known as sramanas. Before the time of the Charvaka school there were other materialistic schools in India, but none of them managed to systematize their teachings like the Charvaka did. The founder of the Charvaka school is considered to be Brihaspati, who seems to be more of a legendary figure rather than an actual person. The most prominent member of this school during the time of the Buddha was a man named Ajita Kesakambali (Ajita of the Hair Blanket), whose ideas are summarized in a Buddhist Pali text known as Samannaphala Sutta, where he denies the doctrine of transmigration of the soul. All things are made of earth, air, fire and water. That which cannot be perceived does not exist; to exist implies to be perceivable. Heaven and hell are nothing but inventions. The only goal of humans is to enjoy pleasures and avoid pain. Providing a good living for the priests is a sufficient explanation for the practice of religion. The members of this school did not believe in ideas such as the soul, reincarnation, spirits, or gods. Religion, they said, is nothing but a fraud devised by clever men who want to take advantage of others. Soul or consciousness can be explained in natural terms as a side effect of having a healthy body: When the body dies, consciousness simply disappears. No existence other than the physical body exists for the Charvaka. The attitude towards human conduct in the Charvaka school was a very flexible one: Right or wrong were seen as merely human conventions. The cosmos, they believed, was indifferent to human behaviour. If this life is all there is, if there is no afterlife whatsoever, then we should live enjoying the physical life the best we can. This poem is particularly provocative if we keep in mind that butter was poured into the sacrificial fire by the Brahman priests. [...] Spells, incantations, rituals, even the duties of the four varnas [castes] - all these are nonsense, invented for the livelihood of those destitute of knowledge and manliness. If a beast slain in the Jvotistoma rite [Vedic ritual] goes straight to heaven, why doesn't the sacrificer offer his father instead? If offerings to priests can feed ancestors in heaven, how is it that that person standing on top of a house cannot be gratified by food served inside? They cannot - because all such long-distance gratification is buffoonery! The materialism that the Charvaka school advocated in India was popular for quite a long time. It claimed that the truth can never be known except through the senses: The body, not the soul, feels, sees, hears and thinks. Religions flourish only because people have become accustomed to them. Faith is destroyed by true knowledge and when this happens, people feel a sense of loss and an uncomfortable void that's difficult to handle. Nature is indifferent to human conventions, such as good and bad or even virtue and vice. The sun shines equally upon sinners and saints. Nostradamus Prediction about India for a King to reign from 2014-2024? The term "Sanatan Dharma" was mentioned and explained in depth in Vedic literature (Rig Veda) (4-138) and was used during the Hindu revivalism movement in order to avoid having to use the term "Hindu" which is of non-native (Persian) origin. The phrase " Dharma Sanātana" occurs both in the Manusmrti (4-138) and in the Bhagavata Purana, in context with "cosmic order".Hinduism, also known as Sanatana Dharma, is the religious tradition indigenous to the Indian subcontinent with about 950 million followers worldwide, making it the third largest religious system in the world. Hinduism differs from most religions in that there is no particular theological belief or set of doctrines that unites all its adherents. The goal of the Hindu path is moksha (literally, 'release'), understood to be liberation from samsara (repeated cycle of birth and death), and this is achieved by piercing the veil of maya (illusion). Some widespread Hindu philosophical concepts and practices are karma (cycle of cause and effect),Dharma (righteousness or obligation), reincarnation and yoga. There is no one book that is considered sacred by all Hindus, but the Vedas, Upanishads, and the Bhagavad Gita are revered by most Hindus. Come back to this page often for news stories, blog posts, music, and scripture commentary. This is research based blog so many items are taken from many sources just for research ,education.. Travel theme. Theme images by ArdenSt. Powered by Blogger.